It is Presidents Day – a time to repost my traditional column commemorating the late, great Richard E. Neustadt. This year the post seems particularly timely, given President Trump’s decision to declare a national emergency in order to free up money to fund construction of a wall along the United States’ southern border with Mexico. Although Trump’s critics view the declaration as another sign of Trump’s authoritarian tendencies – a view consistent with many political science arguments regarding the effectiveness of unilateral presidential action, I suspect Neustadt would have a different reaction to Trump’s decision. He almost certainly would view it as a sign of presidential weakness – not strength. To understand why, it is worth reviewing Neustadt’s argument. 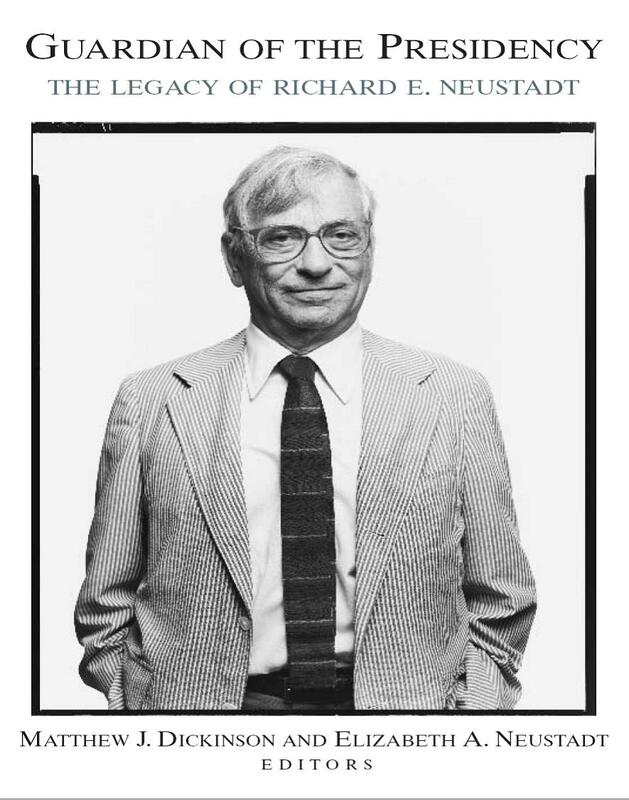 Neustadt was subsequently asked to join Kennedy’s White House staff but – with two growing children whom had already endured his absences in his previous White House stint – he opted instead to stay in academia. He went on to help establish Harvard’s Kennedy School of Government, wrote several more award-winning books, and continued to advise formally or informally every president through Clinton. After the death of Bert, his first wife, he married Shirley Williams, one of the founders of Britain’s Social Democrats Party (and now a Baroness in the House of Lords), which provided still another perspective on executive politics. He also continued churning out graduate students (I was the last doctoral student whose dissertation committee Neustadt chaired at Harvard.) When I went back to Harvard in 1993 as an assistant professor, my education continued; I lured Neustadt out of retirement to co-teach a graduate seminar on the presidency – an experience that deepened my understanding of the office and taught me to appreciate good scotch. It was the last course Neustadt taught in Harvard’s Government Department, but he remained active in public life even after retiring from teaching. Shortly before his death he traveled to Brazil to advise that country’s newly-elected president Lula da Silva. The recent emergency declaration perfectly illustrates Neustadt’s thesis. Trump issued it only after failing to persuade the Democratically-controlled House to fund his proposed border wall in the amount he requested, and after the nation endured a 35-day partial government shutdown that failed to gain Trump any additional traction. Although Trump might yet be able to use the emergency to reallocate appropriated money toward funding the wall, it is a potentially risky strategy – as are most instances in which presidents act “unilaterally” through “command” authority to achieve objectives. In this instance, Trump’s actions will almost certainly be challenged in court, and the long-run repercussions on his sources of influence are at best uncertain. All this is consistent with Neustadt’s warning that unilateral efforts to achieve presidential objectives are typically a sign of weakness, not strength and that in the long run they frequently undercut a president’s sources of bargaining power – particularly his public prestige and professional reputation, to say nothing of his formal powers. It remains to be seen how this latest effort to exercise command authority will play out, but I suspect it will prove costly to Trump in the long run. In response to multiple emails from current and former students, and others, here are some initial and admittedly impressionistic thoughts regarding the Kavanaugh confirmation hearings. As senators Feinstein and Harris were quick to remind Ford, and their audience, yesterday was not a criminal trial. If it were, the proceedings would have ended quickly. There is no evidence that a crime was even committed – at least not enough to bring a legal indictment, never mind determine who is the guilty party. But the Senate hearing was not intended to determine the “truth” of Ford’s allegations, or Kavanaugh’s denials. Nor, contrary to Feinstein’s claim, was it a “job interview” to determine whether Kavanaugh was qualified to serve on the Supreme Court. Instead, the hearing was designed to provide political cover for senators of both parties to vote the way they wanted to vote before the hearings began. All they asked was for their witness to appear credible enough to allow them to cast a vote that could be defended back home, with their constituents. And, in my view, and consistent with the responses I am getting from “normal” people who watched bits and pieces (or even more) of yesterday’s proceedings (I use “normal” in the statistical sense), both Ford and Kavanaugh cleared the bar. Put another way, if you went into yesterday’s hearings believing Kavanaugh was guilty, I am quite sure you came out of it convinced you were right. I suspect that among his defenders there was a similar reaction – “I thought he was innocent, and yesterday proved me correct.” And for those of you who were genuinely undecided? I doubt yesterday clarified anything, and that you are still undecided. Yes, I am fully aware of the inconsistencies in the testimony of Kavanaugh and Ford that advocates on both sides are eagerly rehashing on social media. It’s funny how those inconsistencies always seem to reinforce one’s prior dispositions! Indeed, as I remarked on twitter yesterday, I’ve yet to hear from one person who said that they had changed their views after listening to the testimony by both parties. When I make this argument, students often respond with, “Ok, but what do you think? Is he guilty or not?” My response is that I have a pretty strong belief regarding whether he is guilty. But I also recognize that my belief is not based on any evidence, but instead reflects a gut instinct based on poorly-informed theories of human behavior that may or may not apply here. And guess what – reams of science reminds me that one’s “gut instinct” and “intuition” is often quite wrong; frequently it serves as a manifestation of underlying predispositions that lead one to engage in confirmation bias. Put another way – I recognize that no matter how strong my belief, it is not rooted in any objective assessment of the relevant facts (of which there are almost none), and therefore it is of no value in this debate. So where do we go from here? If my assessment is right – if yesterday’s testimony provided adequate cover for senators to vote their partisan preferences – I suspect Kavanaugh will be confirmed on a near-straight party vote. As I write this, media sources are reporting that Jeff Flake will vote yes. Given their political leanings, I’m guessing Collins and Murkowski will do so as well, and would not be surprised if Manchin and Donnelly cross party lines, given the tough political fight they are facing. As I tweeted yesterday, however, the actual hearing was only the start of the political fight. Much depends on how the media reports that hearing – what sound bites will they use? Visuals? And there is the added layer of extremist voices in social media that may play a role in framing the debate. A final thought. Many activists, particularly those backing Ford, think this confirmation fight will somehow damage the long-term legitimacy of the Court, particularly if Kavanaugh is confirmed. I disagree. That view is based on a willfully misleading impression of the court as a decision-making body composed of priests in robes who divine the “truth” through careful consideration of legal principles. But decades of social science research paints a different picture. Justices are partisan in robes, who interpret ambiguous language in ways that are consistent with their political preferences. Yes, we all are willing to adopt the pretense that the Court is above politics, and I think that fig leaf serves a useful purpose by providing a sheen of legitimacy to court rulings, and compensating for the fact that once confirmed they are not accountable to the people. But partisans on both sides understand the true nature of the Court, and the Kavanaugh confirmation battle will only reinforce what they already know, which is that elections matter, and whichever party has the votes in the Senate will use them to tilt the Court toward their preferred political direction. It has always been thus, and it will always be so. And for those lamenting Kavanaugh’s confirmation – if he is confirmed? 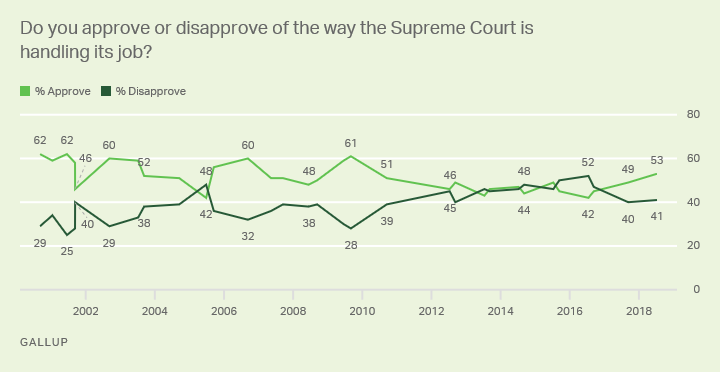 Note that our best guess, based on his record to date (see above) is that Kavanaugh will vote in ways that make him much closer to Thomas, and the right wing of the Court, than to Kennedy’s relatively more centrist views. However, this will likely make Chief Justice Roberts the new swing voter on many issues, replacing Kennedy in that role. And Roberts is, at heart, an institutionalist very concerned with protecting the Court’s perceived legitimacy and public standing. This makes it highly unlikely, in my view, that he will support decisions, such as repealing Roe v. Wade, that run counter to prevailing public opinion. That may provide small comfort to those who believe Ford’s testimony, and who are convinced there is no place on the Supreme Court for a man like Kavanaugh. To you, I say, use that anger constructively – by voting. Control of the Senate – and likely of the federal courts – is at stake.